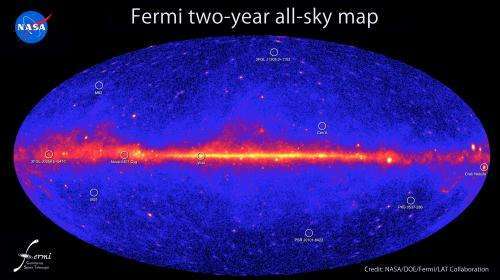 An all-sky map of gamma-ray emissions made by the Fermi Space Telescope. Hundreds of the sources in the map are complete mysteries. NASA's Fermi team recently released the second catalog of gamma-ray sources detected by their satellite's Large Area Telescope (LAT). Of the 1873 sources found, nearly 600 are complete mysteries. No one knows what they are. "Fermi sees gamma rays coming from directions in the sky where there are no obvious objects likely to produce gamma rays," says David Thompson, Fermi Deputy Project Scientist from Goddard Space Flight Center. Gamma rays are by their very nature heralds of great energy and violence. They are a super-energetic form of light produced by sources such as black holes and massive exploding stars. Gamma-rays are so energetic that ordinary lenses and mirrors do not work. As a result, gamma-ray telescopes can't always get a sharp enough focus to determine exactly where the sources are. For two thirds of the new catalog's sources the Fermi scientists can, with at least reasonable certainty, locate a known gamma ray-producing object*, such as a pulsar or blazar, in the vicinity the gamma-rays are coming from. But the remaining third  the "mystery sources" -- have the researchers stumped, at least for now. And they are the most tantalizing. Nearly 600 sources in the latest Fermi catalog are unidentified. "Some of the mystery sources could be clouds of dark matter  something that's never been seen before," speculates Thompson. About 85% of the gravitational mass of the universe is dark matter. The stuff we see makes up the rest. Dark matter is something that pulls on things with the force of its gravity but can't be detected in any other way. It doesn't shine  doesn't emit or scatter light  hence the adjective "dark." "We've been using Fermi to search for dark matter for a long time," says the principal investigator for the Large Area Telescope, Peter Michelson of Stanford University. Some researchers believe that when two dark matter antiparticles bump into each other, they will annihilate, producing gamma rays. Concentrated clouds of dark matter could form a gamma ray source at specific wavelengths detectable by Fermi. "If we see a bump in the gamma-ray spectrum -- a narrow spectral line at high energies corresponding to the energy of the annihilating particles  we could be the first to 'apprehend' dark matter, says Michelson. The team plans to continue observing the mystery sources. Fermi scans the entire sky ever three hours, and this ongoing sequence of observations "piles up" gamma rays for the researchers to analyze. So far, too few gamma rays have been collected from the mystery sources to form definite conclusions. Another, less-dark possibility for some of the mystery sources is colliding galaxy clusters. According to Michelson and Thompson, clashes of such magnitude would generate super large scale shock waves that would accelerate particles. Others of the sources, they say, might be some brand new phenomenon, perhaps something involving galactic black holes. When all is said and done, many of the mystery sources could prove to be familiar. "[They] will probably turn out to be members of known source classes  things we know but haven't recognized yet, like undiscovered pulsars, binary systems, and supernova remnants," says Michelson. "Of course we're hoping for something really exotic like dark matter, but we have to look first at all the other options," says Thompson. "Fermi is an ongoing mission. We'll continue to search for answers to these puzzles and perhaps turn up even more surprises." Will notorious dark matter finally be nabbed? Stay tuned! More information: *Among the known classes in the second Fermi LAT catalog are almost 100 gamma-ray pulsars -- super dense neutron stars that are blinking in gamma rays. They are 1 ½ times the mass of our sun, but crushed to the size of a city. "Pulsars rotate rapidly and the light from them sweeps past us like light from a light house," explains Thompson. "Some of them rotate as fast as a kitchen blender -- hundreds of times per second!" The LAT team has rock- solid identification on 83 pulsars in our own galaxy. But the largest single class of gamma-ray sources the LAT "sees" is blazars from active galactic nuclei. Blazars make up over 1000 of the 1873 sources. "They are of course extra-galactic," says Michelson. "Only about 25 of these are rock solid identifications, but we believe the others, because of their location, are likely associated with active galactic nuclei blazars too." Active galactic nuclei are the cores of galaxies. "The gamma rays are probably coming from the vicinity of black holes, which have 1 million to 1 billion times the mass of our sun," says Thompson. "A black hole pulls everything into itself by virtue of its unbelievable strong gravity. As it does so, enormous energy is released and squirted away from the black hole as a beam of particles and radiation moving at nearly the speed of light. It's called a blazar if the jet is aimed at us and we are looking down the barrel. But the jet of energy doesn't come out of the black hole itself; rather it is powered by material falling into the black hole." Binary systems constitute another known source class in the new catalog. They are made up of a neutron star or black hole orbiting a large normal star. funny, a satellite is going to start studying earth to space lightining bolts that create gamma radiation. Oh, that's a simple one... The galaxy is a giant cyclotron for charged particle.. The gamma rays originate from interactions with the interstellar dark matter, so they origiate from within our own galaxy! ...howz that for a guess? ?